Dr. Yarbrough retired and now enjoys a well deserved break with his family and friends. The mantle was passed on to Dr. Wendi Johnson in November of 2012. Dr. Johnson is a native West Texan who grew up in Andrews, Texas. 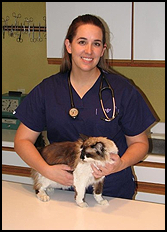 She graduated with her Bachelors of Science in Biology from Oklahoma Panhandle State University and Doctor of Veterinary Medicine from OSU in 2008. In her spare time, she enjoys spending time with her husband and their two sons. She has two dogs, Sonny, a Border Collie mix, and Rascal, a fun loving Labrador, as well as two very playful cats, Bob and Charlie, who she adopted while working at Yarbrough Vet Clinic.